We know it can be difficult to fit your workout in or enjoy a class or a swim when you have little ones. And we all know the energy it takes to look after little ones too! Exercise is a great way of recharging your batteries so you’re ready to take on their boundless energy and enthusiasm! So you can see why our crèche services are a huge plus point for our members with small children. We have a variety of activities for you and your smaller family members. As the YMCA, we believe stronger children and families build stronger communities and so we strive to provide you and your children with many different experiences to support their personal and social development from a young age. We have a number of baby/toddler and parent sessions for you to try out, including swimming lessons for the little ones. For session times and days check out our Swimming for Babies & Toddlers. Or look into our Swimming Lessons and Activities for Babies, Toddlers and Pre-school children. Of course you can go swimming together at times that suit you. Check out our centre Timetables for public swimming times. We have many popular options for quality, low cost Childcare and Parent and Toddler Groups giving them and you the opportunity to play together, meet friends and have fun. Don’t forget our Creche Services also give you the opportunity for some active adult time, while your little ones get some time out from you! Creepy Crawlies – parent and child fun play sessions for ages 0-8. 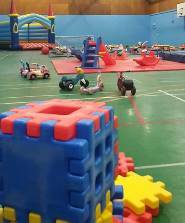 Ride on toys, bouncy castle, games and lots of safe space to run around and have fun together. Creepies is available at YMCA Fleetwood and YMCA Thornton. Check out our Kids, Teens and Families Timetables for session times. Harry’s Indoor Soft Play Centre – a great place for little ones aged 6 months up to 10 years old. For babies up to pre-school age there are two separate play areas away from the juniors larger play area. Harry’s is a secure, safe, and stimulating play space for them to roll, crawl, toddle and run about! Harry’s is based inside St Annes YMCA. Pre-school gymnastics is now available at YMCA Thornton for ages 3 and up. Our YMCA Sports Academy Team deliver pre-school football session for ages 3 – 4 at YMCA St Annes YMCA and YMCA Lytham.